Plastic yokes end in male threads. The Fleck 5600 valve used on most of our residential filters and softeners needs either a yoke or a by-pass valve to attach it to your plumbing. Yokes and by-pass valves attach easily to the back of the valve with a bracket supported by a single screw. The same bypass valves and yokes are used with Fleck 2510 and Fleck 7000 filters. The plastic yoke simply provides a way to attach pipe to your filter. The stainless steel bypass valve provides a threaded fitting to attach to, plus it allows you to divert water around the filter. The bypass is especially valuable if you need to work on the filter without interrupting service to the home. 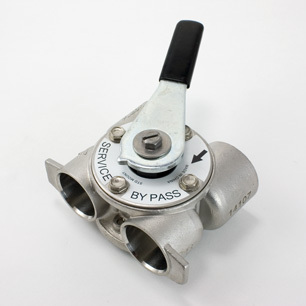 Stainless steel bypass valves provide a female thread to connect to. Point the handle arrow to “Service” to send water through the filter. Move to “bypass” to take the filter offline and allow unfiltered water to flow to the house. The filter needs either a yoke or a bypass valve, but not both. 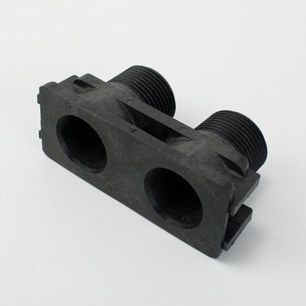 Both yoke and bypass are available in 3/4" or 1".